William “Bill” Harwood Jones, 91, fortified with the Sacraments of the Holy Mother Church, passed away at 11:47 P.M. on April 11, 2019, at his home in Mount Vernon, Illinois. Bill graduated from Mount Vernon High School in 1945 and served in the Unites States Army in France and Germany during World War II. After leaving the Army, he worked for Western Electric in Springfield, Illinois for two years and for Tri-County Electric Co-op for forty-three years in management. Bill married Ruth on June 21, 1948 at Saint Mary Immaculate Conception Catholic Church in Mount Vernon, Illinois. He was very active in his church. 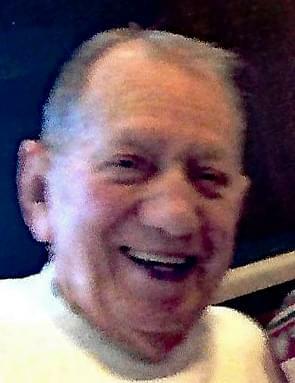 He served on many committees and was a Boy Scout leader and high school church league basketball coach. In retirement, he was a volunteer for seventeen years with the American Red Cross and traveled to many natural disasters throughout the country to give aid to those in need. He was a charter member of the Knights of Columbus Council No. 2964. He attained the Knights’ highest rank of Fourth Degree and served many years as the Council’s Faithful Navigator. In December 2018, he was designated the Council’s Knight of the Century. He was also a member of the Sons of the American Revolution and the Mount Vernon American Legion Post #141. Bill leaves a legacy of duty to his country, pride in his family, and service to his church and community. He loved his family and he loved to travel. He was always willing to help anyone at any time. Bill’s family is grateful for the thoughtful care of Dr. Mohammed Haseeb along with many friends and caregivers. A Visitation will be held from 5:00 to 7:30 P.M. Tuesday, April 16, 2019 at Hughey Funeral Home in Mount Vernon, Illinois, with a Rosary Service beginning at 7:30 P.M. Morning Visitation will be held from 9:00 to 10:00 A.M. Wednesday, April 17, 2019 at Saint Mary Immaculate Conception Catholic Church in Mount Vernon. A Funeral Mass will begin at 10:00 A.M. at the church with Father John Iffert and Monsignor Dan Jurek officiating. Interment will follow at Saint Mary’s Cemetery in Mount Vernon. Members of the Mount Vernon American Legion Post #141 will conduct a Flag Presentation Ceremony at the cemetery. Memorials may be made to the Saint Mary Immaculate Conception Catholic Church. Call Hughey Funeral Home at 618-242-3348 or visit hugheyfh.com for further information. Bill was born February 16, 1927 in Cairo, Illinois to the late Loysette H. and Myrtle (Barry) Jones. He is survived by his beloved wife of 70 years, Ruth Helen (Kuenz) Jones. Bill was preceded in death by his parents; his sister, Phyllis Karch; his brothers, Father John Barry Jones and Patrick Loysette Jones; his brothers-in-law, Ralph Karch, Gale Davis, and John Joseph Conway; his sisters-in-law, Jean Davis and Mary Helen Kuenz; and his son-in-law, Ricky May.